It is no secret that the Hilliard Davidson football team has been a strong pipeline to the Capital University football program for over 50 years. However, there has never been this many former Wildcats on the same Crusaders roster at the same time. Currently there are eight Davidson alumni on the Capital roster, and all but two of them have started at least one game. Leading the way for the Capital defense is sophomore safety, Jimmy Curtis. At the half-season mark Curtis leads the team with 24 solo tackles, 4 pass deflections, 3 break-ups, and ranks second in total tackles with 27. He also has 1 ½ tackles for loss, a forced fumble and an interception. Not bad for a guy that has not played since the 2011 season when he was a freshman at Kentucky Christian University. Jared Johns is also making a strong contribution for the defense. For a true freshman that only dabbled on defense at the high school level, Johns looks like a seasoned veteran at his defensive tackle position. Johns was an All-Ohio center for Hilliard Davidson. Through five games Johns leads the defense with 4 ½ tackles for loss and 2 ½ sacks. He also has 16 total tackles. Also on defense is Brett Annis (Freshman), Travis Brown (Freshman) and Nick Wright (Sophomore). Brown has started all five games at middle linebacker and has 12 solo tackles, 7 assists and 1 ½ tackles for loss. 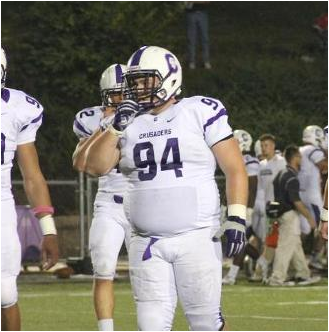 Annis made his first collegiate start at defensive end yesterday against Otterbein. On the season he has 12 total tackles and 2 ½ tackles for loss. Nick Wright is also seeing considerable playing time at defensive tackle. On offense Nick Iske (Freshman) has started he past three games at under center, taking over for Hilliard Darby alum, Chase Longwell. Though Iske has yet to earn a win as a starter it is evident that he is getting stronger with every rep. Through five games he has thrown for 376 yards and 2 touchdowns on 65 passes. He has also ran for 175 yards and 3 touchdowns on 71 carries. Rounding out the offense is Nolan Gill (Senior) and Nick Waters (Sophomore). Nolan Gill has started every game at slotback this season and has 149 yards on 21 carries. Waters has played in all five games as a reserve slotback and has 2 receptions for 29 yards. Other Davidson alumni in NCAA DIII is Tyler Baker (Junior, Mount Union), Tyler Doty (Sophomore, Case Western), Nick Stull (Freshman, John Carroll). Baker has played in all five games for the #3 nationally ranked Purple Raiders (5-0), and started at center in a 75-0 win over Capital University on October 4th. Doty and Stull have both played 3 games apiece in a reserve roll. Doty has 5 total tackles for Case Western (2-3), while Stull has one solo tackle for the #6 nationally ranked Blue Streaks (5-0). Jeremiah Detmer is still kicking it as one of the best in the FBS. Detmer entered his senior season on the watch list for the Lou Groza award, awarded annually to the nation’s top collegiate place-kicker. On the year he has made 12 of 15 field goal attempts, and 26 of 27 extra point attempts. His long is 41 yards. Other FBS alumni seeing playing time are Keith Heitzman (Redshirt Junior, Michigan) and Bryce Lehwald (Junior, Miami University). Heitzman, now a tight end, has played in all 7 games for Michigan and recorded 1 reception for 26 yards, while Lehwald has played in 5 games at long snapper. At Butler Kyle Annis recently saw his streak of 29 straight starts come to an end, having sat out the Bulldogs most recent game against Campbell. That's not to say he hasn't already continued an already successful career. Through the first five games of the season Annis had 13 total tackles, 3 tackles for loss, and 1½ sacks. Also in FCS Jordan Weatherby has seen playing time in two games. Also playing college football this season is Alex Backenstoe (Freshman, Air Force), Dametrious Clark (Freshman, Walsh), Jack Johns (Freshman, Findlay), Phillipie Motley (Freshman, Pittsburgh), and Kyle Payton (Redshirt Junior, Kent State).